Description: The OmniDunk challenges kids to a professional game of basketball! The basket, which is located at the official competition height, is highly resistant to vandalism as a result of the materials used and the sturdy foundations. The ‘long arm’ to which the basket is attached ensures that there is plenty of runback space after the dunk. 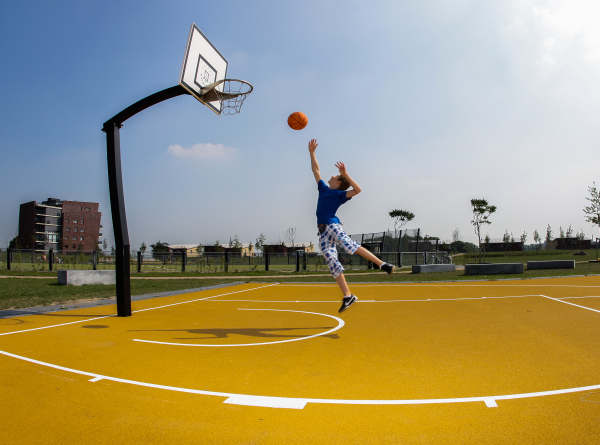 The Omnidunk can be integrated in the Omnistadium or is available separately so that it can be used as a sporty addition to any playground or field. – Designed for a professional basketball game. Instructions: Aim , Jump, Shoot !